Two weeks ago everything was great. 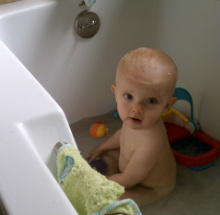 My son William had headed for one of his favorite activities: the bath. What a lucky life these little ones lead being perfectly normal in our eyes to splash, kick, and roll around naked in the water just cause it feels good. If we tried this at the gym pool we would be lucky to keep our membership, naked or not. But as with all good things I begin to notice a subtle change in his demeanor. I quickly recognized the onset of a new player in the room. This player has appeared before during bath time, but there was something extra sinister about today. Could it be that because Will was sitting at the far corner of our deep tub that gave this new player all his power, or did he know at four and a half months pregnant it was difficult for me to get Will out quickly? This player, this enemy, simply put was a bowel movement. Now I can see how going in the tub seems like a good idea to my son. The water's warm, and the body's relaxed. But of course he does not yet understand the "icky" nature of what this means in terms of health concerns and not to mention the extra work for me. To make it even more maddening he happening to be sitting on the pebble looking nonskid mat placed on the floor of the shower to prevent him from sliding all over the place. So now, on top of dirty water and a not too happy kid at having to be prematurely yanked from his lovely play time, I am left with the joyful task of scrubbing and disinfecting the tub and textured mat that I am now questioning as a reasonable purchase. Trying to minimize the damage, I get Will to his room to get dressed. I do the full deal, drying all the parts, cleaning his ears, even applying lotion. I did not let myself get sloppy as a mom because I knew the unplesant work left for me in the tub. Will was dressed in grey pants and a red short sleeve onsie that is particularly cute because it has a motor scooter on the front. He was finally clean and neat so I was free to return to the bathroom to face the challenger that awaited. It was everywhere floor, rug, books, and of course the new clean outfit I just put on him less and ten minutes ago.